If someone told me two years ago that I’d be making vegan grilled cheese sandwiches that tasted just like grilled cheese sandwiches out of coconut milk, coconut vinegar and agar powder and blogging about it, I would have thought they were out of their mind. The first assumption I would have made is that it would taste like coconut, which would be incorrect. The second assumption I would have made it that it would taste like cheese, but in weird, fake and compromising way, which would also be incorrect. This cheese is simply fantastic and has been an obsession of mine since I whipped up my first batch of it last February (although I tweak this version a bit each time based on the type of cheese I’m trying to recreate). Serve this grilled cheese by itself or with the best accompaniment—homey and comforting smoky tomato soup—for a perfect lunch or light dinner that’s easy to make and amazing to eat. Heat the oil in a medium-sized saucepan over medium heat. Add in the onions and saute until translucent and slightly browned, about seven minutes. Reduce the heat to medium low, then add in the garlic, spices and liquid smoke. Allow to saute for about 3 minutes, stirring occassionally. Now add in the prepared roma tomatoes and vegan broth. Return the heat to medium until the soup comes to a very small boil. Then dial the heat back down to low and allow to simmer for about 15 minutes. Place a 1/2 Tb of Earth Balance into a skillet over medium heat. Spread one of the slices of bread with a thin layer of the cheese, then place the bread, cheese side up, on the skillet. Swirl it around to ensure it gets coated well with the vegan butter. Spread the other slice of bread with the softened butter and place it, butter side up, on top. Allow the bread to nicely brown on one side before flipping it over with a spatula, about 4 minutes. Sprinkle with a little salt on top if desired. That looks good, guess I need to follow you:) You're sure it doesn't taste like coconut? It's a natural smoke flavor in liquid form. I just updated the post with a link to the product. It's not completely necessary for the soup, but gives it a nice subtle smoky flavor. I hope you enjoy the recipe! Many thanks for sharing the recipe. Just got farmers market tomatoes so you have inspired me! Cheers! yum! 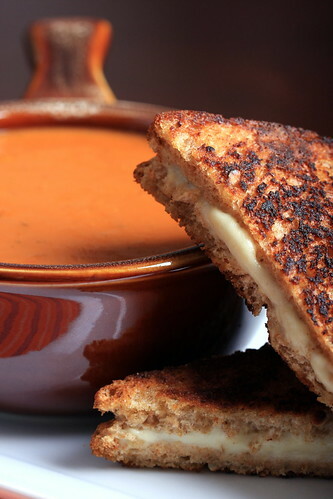 grilled cheese and tomato soup is an old old obsession of mine, tho i haven't had the combo in countless years. i want. Thanks Kittee. I don't know exactly what it is about this combo that is so comforting and homey, but it makes me so happy every time I have it! Have been craving grilled cheese for a week now! ha ha, no worries. It's completely vegan. gawd, i haven't had a proper grilled cheese sandwich + tomato soup combo in ages. the first time i ever had this combo was in college, on a really cold blustery sunday afternoon, hung over and in need of grease & comfort. i am finally inspired to attempt this vegan cheese making, what brand of coconut vinegar do you use? i looked online and there's a lot to choose from. This will totally fulfill your need for grease & comfort, Lan! I use a brand called "coconut secret" from Whole Foods, but I've seen it in asian markets for much, much cheaper. However, you only use a tsp or so for each batch, so even if you get a more expensive brand, it will last you a billion years. i bought a bottle, i already forget the brand, at wegman's yesterday and will be attempting this this weekend. the boytoy is very skeptical! me, i'm super excited. Can you use another kind of vinegar, or does coconut vinegar have a unique property? Thanks! I believe it is fermented sap from the coconut tree. It's a lesser-known product, but one of my favorite ingredients to use! Can you sub a different type of vinegar if you don't have coconut vinegar? 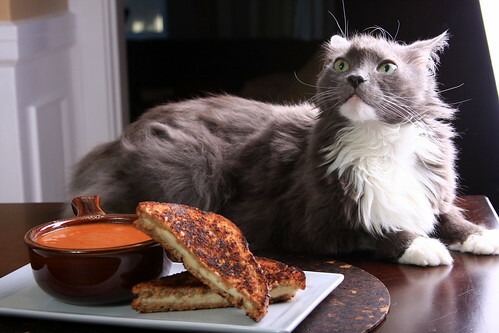 I could kill for a grilled cheese and tomato soup right now. I don't like any of the vegan cheeses available to me so I'm going to have to dig though my closet and find my supply of agar and make this. This is so intriguing, I'll definitely have to try it!! Where do you buy coconut vinegar? Can I substitute a different kind of vinegar, or does it have to be coconut? Jasmine, I bought my coconut vinegar at whole foods, but you can alos buy it on amazon or in most asian markets. Another blogger used balsamic vinegar to make this with good results. I have not tried ACV, but it may be worth a try! Wow, a recipe for vegan cheese that looks easy and totally doable! Question – can you substitute the coconut vinegar for another type? Apple cider vinegar, perhaps? Rachel — see comment above. I would experiment and see what happens! This looks amazing! I wonder if it would work with apple cider vinegar? It's short for nutritional yeast. A deactivated yeast that has a parmesan-like flavor and chock full of B12. I'm not sure of the availability outside of the US? Oh that is funny! I was wondering what nooch is too! Have been cooking with nutritional yeast for a decade, but have never heard it called that. I guess that is why these question forums exist. Awesome! I just made another serving for dinner tonight. The soup tasted even better the next day and the sandwich was amazing dipped into the soup! love that gorgeous tomato soup and the sandwich and i am super excited about veganmofo too! How long do you think the "cheese" will keep? And do you think regular flour would work since it's such a small amount? Thanks! Probably a few days. The tapioca flour is what makes it gooey and stretchy like cheese, so I don't think you would achieve the same results with regular flour. Rose, my assumption is that the acid in ACV must react differently with agar, causing your gelling issue. The taste of ACV is different from coconut vinegar too, which may explain why you tasted the coconut. Several folks have asked if ACV would be a good substitute here for the coconut vinegar, to which I have replied, "I am not sure, but try it." But I guess my answer from now on will be "no!" I think this sounds amazing! Awesome — thanks for letting me know, tess! So glad you like it! I'm nervous with the nutritional yeast – I feel like every time I use it the end product tastes powder-y? Do you ever have trouble with this? I haven't experienced that, but nooch isn't a crucial ingredient here, so if you leave it out, it will still taste good. I made this on Saturday with the soup… and then I made the cheese sammiches again the next day with tomato slices on it leftover! THANK YOU THANK YOU it is soooooooooooooooo amazing! Way better than all of the store-bought vegan cheeses, and less processed too! You are a saint! What a pretty kitty! I've never heard of coconut vinegar, I'll have to check that out. Agar cheese with coconut milk is divine! I think aside from fermented cheeses it's my favorite. When I make mine I like to use it on pineapple and tempeh bacon pizza. This looks so good right now, with the temperatures dropping, I'm craving soup! Has anyone tried substituting lemon juice for the coconut vinegar? Justina, I would not recommend using lemon juice as a sub for the vinegar — the taste of lemon will be too strong and incompatible with the other flavors. Honestly, I had about given up on trying to create a yummy grilled cheese (I've tried three recipes in the last month with "fake"cheese) UNTIL tonight. I don't know how those ingredients added up to cheese but I won't ever go back to store bought "fake cheese". Absolutely….Amazing! Thank you so much!!! Quick question- you mentioned that you have adjusted it depending on the kind of cheese you'd like. Would you mind sharing the adjustments? This is amazing! It scared my dad because of how much it tasted like cheese. My only quibble is…. how did you get it to seemingly spread so nicely like it looks in the photo? WHen I tried spreading it, it just got mashed into clumps rather than spread, which I found can be characteristic of things made with agar…. any tips or ideas? Nalani, so glad you enjoyed it! I don't recall doing anything in particular to get the smoothness — I just let it melt between the bread and it seemed to ooze pretty evenly. Maybe try to stir the cheese up and get it smooth before spreading it over the bread? Thing is, when mine solidified it kind of felt like a really dense, solid, jello block, hence the funky spreading. WHen I tried to spread it I ended up smashing the bread more than I would've liked. I can't imagine stirring it after setting, was it supposed to be softer? Did I use too much agar? I really loved it though, it tasted great. I'll try your other cheese recipies some other time too. Agar brands vary in quality and firmness, so it may be the agar. Next time you make it, maybe try putting it in a small food processor to break it up, or throw the whole block into a pan for a few minutes over low heat to help it get a little melty and oozey so its more spreadable. I just made this with Apple Cider Vinegar and it turned out AMAZING! I have tried so many "cheese" recipes and they have all been delicious, but more of a vegan pate. This is like cheese! You have saved me from having to buy expensive daiya every week! Thank you, thank you, thank you! I was very skeptical about this recipe because I have tried SO many different recipes and I'm always disappointed. This one really hit the mark though! It not only has a wonderful flavor but it honestly has the exact mouth feel of cheese. I haven't been a vegan long enough to have forgotten so I know it isn't just wishful thinking 🙂 Thank you so very much for sharing this great recipe. By the way, I used ACV with, obviously, excellent results. I'm so glad you liked it, Lisa! And thank you for your very kind feedback! This was wonderful! It took me a few weeks to gather all the ingredients (I had never heard of coconut vinegar) but it was so worth it! Now I can have a tasty grilled cheese sandwich anytime I want! Thanks! So glad you liked it CeliMary, and thanks for letting me know. Coconut vinegar is such a wonderful yet little-known ingredient! Your cheese recipe tastes amazing! I tried a cheese recipe with agar before and it was horrible. This recipe was so simple. Thanks for sharing it, this is surely one to complete with my cashew cheese sauce, especially since I can put it in a sandwich, yum! Note: I didn't have any coconut vinegar so I swapped it for white vinegar (3parts white vinegar & 1part water). Oh my god i am soooo excited about the fromage recipe! I'm really excited to try this. I SO miss grilled cheese sandwiches. I buy coconut milk in bulk though, so I don't know what quantity is in a can. How much coconut milk does the recipe call for? Thx! This recipe calls for 6.83 fl. oz., or half of a standard 13.66 fl. oz. can. I updated that in the recipe to be more clear. I hope you enjoy! I've been wanting to make this grilled cheese for forever!! Finally got all the ingredients. Whole Foods only had agar flakes, not powder. Other recipes show just heating it longer. My husband suggested maybe running them through the coffee grinder to make into powder like we do for flax. Never having worked with agar before, any input on if you have flakes how to make this work best? Good luck and I hope you enjoy the cheese! Can I use cashew cream instead of coconut? Not sure that would produce similar results, but it may be worth a try to see what happens! Thanks for trying it out both ways, and letting me know the results, Nadia — I will have to try it out! Yummy…saving this to Pinterest! I will make only one change…I always use olive oil rather than butter to add a nice crispiness to grilled sandwiches. 🙂 thanks for this wonderful recipe…can't wait to try it! Hi there, this recipe sounds amazing and I'm so glad that I came across it. I'm gathering all the ingredients tomorrow and having a go! Just out of curiosity – would you happen to know the nutritional information for the cheese? And if possible the sandwich and soup as well? Thanks in advance! I'm so happy you are trying it out! Sorry, I don't track nutritional info for anything here. I hope you enjoy the soup/sandwich! I love this cheese recipe! I've made it over 10 times, it always worked and is sooo gooood – especially with homemade bread. But I always leave out the nooch, the first time the nutritional yeast was just settling at the bottom. So I started making it without the nooch and it's perfect. Thank you so much for sharing this recipe! So happy you like, and thanks for your kind feedback! I made this recipe with apple cider vinegar in place of the coconut vinegar, and it turned out wonderfully. As a caveat, I make this claim without knowing what the original tastes like because I've never owned or used coconut vinegar. I also use 1.5x the amount of nutritional yeast, because I like a stronger cheese flavour. I've really enjoyed putting this cheese on my vegan pizzas and on nachos. It reminds me so much of childhood. The cheese flavour is a bit like what I remember jarred nacho cheese to taste like when I compare it to memories of regular shredded cheeses, but that quality is negated by how easy this recipe is, and how the flavour changes when I combine it with food. Also, I like that this recipe is incredibly versatile when I change up the agar agar and salt quantities. Thank you so much for this delicious, almost-all-purpose cheese recipe! Savannah, thanks so much for your kind feedback, I am thrilled that you enjoy this recipe and were able to adapt with good results! I was a bit skeptical, but decided to give this a go anyway. After a trip to Whole Foods for some coconut vinegar, I whipped up a double batch in no time (so glad this is super easy to make). It was, surprisingly, very good – a MILLION times better than the greasy Daiya or pasty tofutti. I hate those cheeses and only use them sparingly in a few dishes. I'm going to try this cheese for other things like pizza and nachos like the previous poster mentioned. I think it'll prove to be very versatile. Unfortunately, it's still not quite the same as a true grilled cheese…. while I find it super yummy, this is one of those recipes that I would never serve to guests unless they were vegan/dairy free. Thanks so much for sharing!! This “cheese” is AMAZING – warning once you start you will always need to have some on hand, good news is once you have the ingredients on hand it takes less than 5 minutes to whip up a batch. Also, you can make it with light coconut milk, maybe not quite as delicious but necessary when you go thru it like we do! I have never heard of agar powder. Julia, you can buy agar powder on amazon or in any Japanese market. Any brand’ll do. Man, I have tried so many faux cheese recipes that promised they were the best, but they are nothing compared to this. It is the only one that my DH has liked. I only wish that I had found it when you first published it.I used cane vinegar since that is what I had on hand. The soup is next on my list to try. Jwiltz, thanks for your kind feedback and I’m so happy you and your DH liked! I’ve never heard of cane vinegar before, but now I’m off to google it!